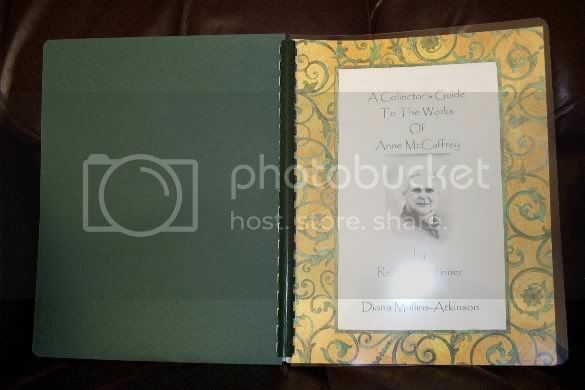 I have co-written A Collector's Guide to the Works of Anne McCaffrey and, with Cheryl's permission, am offering copies for sale here at MoM. 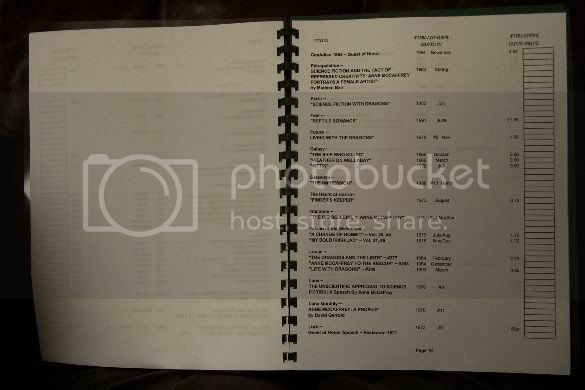 The Guide was written back in 1999 and is up-to-date through that year. The Guide was created because we were collecting so many items with no organized way of recording what we had in our possession. We found the Hargreaves book, but didn't want to mark in it, of course, so we started talking about what sort of book would have been helpful in our search. We wanted it to be flexible for ease in carrying and using in the sometimes cramped book stores we frequented. We decided the size should be 8½ X 11 with a clear plastic cover and a heavy cardstock backing. All is bound together with a comb-binding system. We wanted to be able to list the price we paid for the books, so we could see the value increase, or decrease, and also prove what we paid for the book. We also wanted some information that would help us understand what all the numbers meant on the copyright page. How to take care of our books once we got them home. And clarification of terminology like - Autographed vs Inscribed and we include a Glossary. I've sold several copies of The Guide on eBay over the past few years at around $15.00 each, but for fellow MoM members I am discounting it to $10.00 US, plus postage. Postage in the US could vary, but I'm seeing Priority Mail at $4.05 on the postage calculator. I will ship Internationally! The postage calculator shows $9.50 as being the cost for the UK and Australia, so probably the same for all countries. I will check the rate though before sending a total. All payments will need to be in US dollars, sorry I don't have a foreign dollar account. If you are interested in ordering a copy of The Guide, please PM me. Our postage costs just recently went up - Priority Mail in the US is now $4.60 and Global Priority is $12.00. So please be sure to factor that in when you're considering purchasing a Guide. Thanks! Costs for the components to make the guides have gone up over the years and I've not raised the price of the Guide, until now. So they'll be $17.05 and a $5.00 discount for MoMers.....so your price is $12.05. First Class Mail International Package is $10.30 US. I can't find the Global Priority at the moment, I'll check with an actual post office to see if it's still available or not. Global Priority is now $12.95, so not that much more to get it across the waters a bit quicker. This is wonderfull Becky, I was hoping that you would do something like this. My copy is fantastic to have and use, I keep it next to my computer always( ) for a fast check on a book that I have found, then I will look it up in my Hargreaves for an indepth study on whatever copy of a book I am wanting to buy. YOUR Guide!!! is so handy to have and use, I wouldn't want to be with out one, and as I have said before to you, I want to add one into my collection to keep unwritten in , as my first copy is a complete mess with all the scribles in it. can you send me a signed bookplate, please? yes yes yes Sign my copy too! Oh, goodness! I'll have to sign them all I guess.....And Hans, I told you I was sorry!!!! I've got a White Dragon cover bookplate (Whelan art) that I can sign and will be happy to mail to you. Is that ok?? Maelin, thanks for your kind words, Hans and Matt too!!! You've done EXACTLY what you're supposed to do with the Guide......mark it all up!!!! USE it don't just look at it. but now you offered it seems a marvelous thing to do, so if you don't mind? I'll gladly reimburse you for the cost (maybe I can at least pay the postage through paypal?). Edith, I do list US and UK editions in the Guide. So it will work for you as well. Both paperback and hardcover books can have a couple of different '1st' editions. If a new publisher gets the book they'll put out their own 1st edition. The Coelura was first done by Underwood-Miller and then done by TOR, so there are two different hardcover 1st editions. Tho Underwood-Miller is the true 1st, but I've got both since they're out there to buy. Hans, I'll gladly drop it in the mail for you! No worries on the postage! (I'll atone for not signing it that way.) Hey, no worries on eBay bidding. It's all fair as far as I'm concerned. I put in my max bid and if someone goes higher then they are welcome to the item. I always put in the highest amount I'm willing to spend and if someone is willing to give more then it's theirs. If I wasn't willing to spend what I bid then I shouldn't be bidding. So you go ahead and don't let me stop your bidding, Hans! Becky, I was carefull the other day when I saw that you had a bid on one of the items that I was looking to buy. I waited to see if you got it and when I saw that you were out bid, and didn't bid back over the new bidder, I jumped in and got it. That was "The Ship Who Sang" magazine that I won on ebay the other day.........YEAH !!! I also wouldn't bid against you or any one that I was friends with. I would wait like I did, to see how serious my friend was at bidding for the item. Edi, I most heartily recomend "A Collector's Guide to the Works of Anne Mcaffrey", Becky and her friend did a fantastic job with it. I have it next to my computer always, and use it for the quick scan, and tracking of my books. My husband is using it now when ever he goes looking for a book for me. Hans, LA LA LA LA LA, I already have mine signed( dancing around the room in glee). Matt, I am not on the computer all the time to really watch bids that I make. So I just place my bid at the max I'm willing to pay for an item and hope for the best. If I'm outbid then I'm outbid and congratulate anyone who does get the item. Especially like Maelin did. Good job Maelin, by the way! I'm glad you got the mag!! I've got a pretty good collection so am not in 'need' of any particular item. Now when I was looking for books a few years ago, I'd indeed watch the item til the last minute. So I've done that for sure, Matt! There are a few items I'm looking for now, since I went thru my collection last weekend. I want to update to better quality copies of a few magazines. But I'll just take my time and 'hunt'. That's the fun part, the hunt!! Dyna, I've put you on the list for a Guide. I'll get your mailing information as soon as I put together some copies of the Guide. I self publish so it does take a bit of time for me to get them all done. Since I've gotten several orders for the Guide I'm going to get the copies made today. I'll then get to binding them either Sunday or later in the week. I'll be PMing those who've ordered to get your mailing addresses once I've got them all done. Payment arrangements can be made and the Guide will soon be on it's way! Note to self - Remember to sign them!!! Last edited by Becky; May 6 2006 at 10:47 AM. Hans!!! I have to remember to do your book plate too! I'm so glad that you are enjoying the Guide, Maelin! And that you're finding it so easy to use. Any Chance that I can give him a "LA LA LA LA LA" , over the one thing that I have mangaed to get that he doesn't have yet, is fair. And very fleetingly fun for me.... ....It will only last as long as it takes for him to get your signed book plate.... .....Then I will be left with a "I had mine first" puff of hot air. Too funny!!! Ok, enjoy your moment Maelin! Enjoy your dancing then! Live it up! Glad you got it Matt! I do hope it helps your collecting and tracking of the collection. There are a few anthologies I really want now that I know they exist! I'm very amazed at the extent of stuff in there. So many books. Do you have all of it??? When I started the Guide it consisted only of items I owned or knew for sure existed (which would be the 1st edition novels) or if one of my two other collector friends owned. We kept finding reprints of some stories, like Smallest Dragonboy, and decided to stop adding each reprint and go with some special printings and the original appearance of the story. One of my dream items.....hmmm, that sounds like another thread to start. So you'll have to go read that one to find out more. But, yes, I do have a lot of what's in the Guide. That's why I helped put it together. Had to track what I had! Just bumping this up to the top so it doesn't get lost. C_ris, I sure hope that you like Beckys guide as much as I do, it is so handy to glance at when you have a book in your sights to buy. Yep, it's a useful guide. There are numerous items that I'm on the look out for now! Little did you know, Matt, that when you dropped in on Mom that you'd run into this sort of insanity! Glad I could help you with it! I know where the shops are in Aber! 2 private 2nd hand shops and an oxfam bookshop! C_ris, that's exactly what it was made for, ease in hunting in those book stores. Enjoy! I love the book. It seems to be pretty complete too. Easier to use than the Hargrave one, when you just want to browse book stores. Thanks, JJ, I love Hargreaves but it isn't very condusive to book store browsing. Hence, the Guide! I needed something portable and easy to use. We made the back cover of fairly stiff stock to help give some suport, but not too much to make it cumbersome. I hope you have loads of fun hunting the stores!